If you’ve ever wanted to drive a golf ball with the explosive power of a rocket, leaving your playing partners with their jaws on the ground in envy… while at the same time finding the fairway and attacking the pins with laser-like accuracy, then I’ve got something you need to hear about! 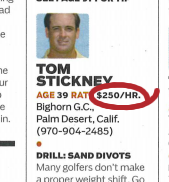 My name is Tom Stickney and I’m a Golf Magazine Top 100 Teacher and the Director of Instruction at Bighorn Golf Club in Palm Desert, CA. I’ve been on the lesson tee for 20 years and I’ve just about seen it all. I’ve worked with beginners on up through professional golfers… and everything in between. …the simple fact is that the vast majority of golfers barely improve their game, if at all. And it certainly isn’t for lack of trying. I’ve seen students spend thousands of dollars on lessons, training aids, and gadgets that promised the moon… only to leave them disappointed, frustrated, and no better at hitting a golf ball… and in some cases even worse! If you’re reading this right now I’m sure you know the frustration… not knowing whether your next swing will split the fairway or send your ball screaming into the woods. Is that it doesn’t need to be this way! And it’s not that these ideas are wrong… but the reality is they aren’t so much fixed rules but working suggestions. They can be helpful to think about from time to time, but focusing too much on these types of swing thoughts is a mistake. One part of the swing that completely determines your ball flight. If you get this part right, you WILL hit a great golf shot. If you mess this part up, you CAN’T hit a good golf shot. It’s an idea I’ve been developing my entire career. First in my own game and in private lessons with clients… Later by studying video of players of all ability levels… And most recently with the help of cutting edge technology like launch monitors. But probably the easiest way to demonstrate this principle… this ONE absolute rule of the golf swing… is to look at the swings of the top professionals in the world. There is no ONE right way to swing a golf club. And the most striking thing about it is how completely DIFFERENT they look. Different leg, arm, and hand motions. 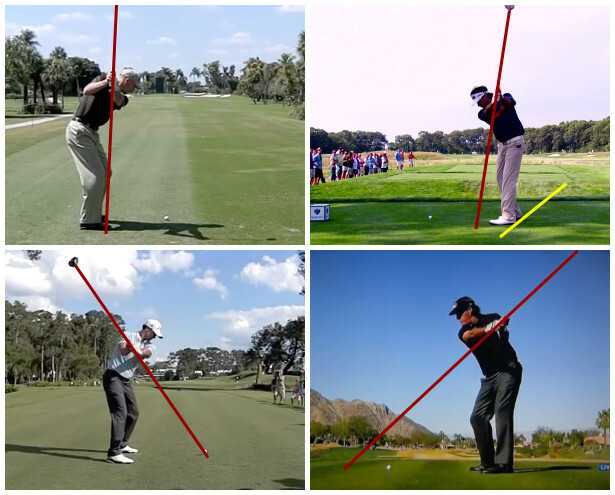 Yet with these radically different looking swings… each of these players produces the same world-class ball flight. Everything about your ball flight… it’s distance, direction, curvature, and trajectory… is entirely determined by how your club moves through the critical impact position. 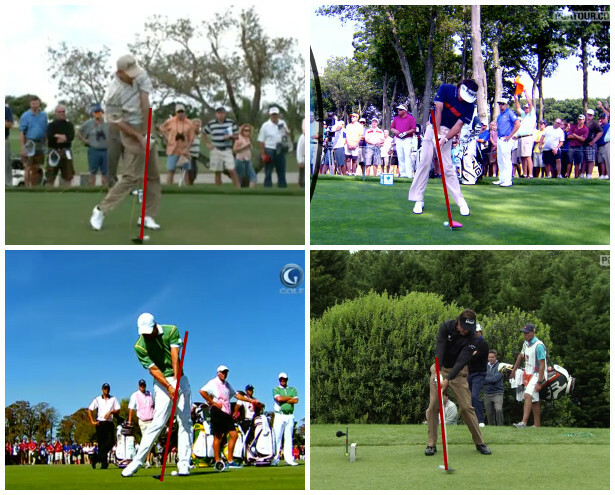 And if we fast forward our 4 professional swings we will indeed see that despite their radically different positions in the back swing… they are all in the identical impact position! We can demonstrate this time and again using high speed video. And we can confirm it by measuring the direction, the angles, and the speed of the club head using the latest technology. But if you simply take a step back to think about it, you will see that not only does the impact rule make sense… it actually HAS to be true. 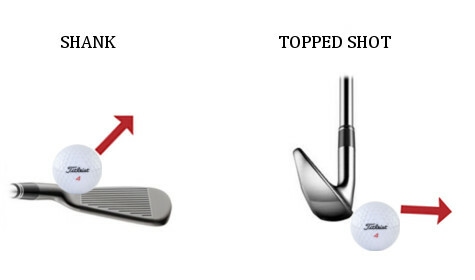 After all, the impact position is the ONLY point in the swing where the club makes contact with the ball. The laws of physics actually prevent the club from influencing the ball flight at any other point during the swing. Think about it… the golf ball doesn’t care or even know what your left arm does, whether your head moved, or how long your backswing was… it only knows what the club head was doing at impact. …while beginners and hackers look completely different. What exactly does a good impact position look like? The first Impact Factor is your Club Face Angle. At impact, your club face can be in 1 of 3 conditions: open, closed, or square relative to the target. Just how important is Impact Factor #1? Well, with the help of the latest technology we know that around 85% of your ball’s initial direction is determined by the angle your club face is pointing in at impact… whether it is open, closed, or square to your target. In other words it’s pretty darned important! The 2nd Impact Factor is your club path, which is the direction your club is moving relative to the target. Your Club Path works together with your Club Face Angle to determine your ball’s curvature. Specifically, when your club face angle and club path point in different direction, your ball starts where your club face is pointing and curves AWAY from your club path. The 3rd Impact Factor is your Angle of Attack. For most shots, the correct Angle of Attack is slightly descending, with the low point a few inches in front of the ball. This provides for the most consistent impact, helps put backspin on the ball, and sets the loft correctly. If your low point is directly under the ball or before it – your club will tend to catch the grass before the ball which robs you of power and can twist the club face, producing inconsistent contact and inaccurate shots. The 4th Impact Factor is where the ball contacts your club face relative to the sweet spot. Just like in baseball or tennis, hitting the sweet spot transfers the maximum amount of power to the ball. Missing the sweet spot is a major “power leak” and also produces mishits in all directions… pushes, pulls, slices, and hooks. OK, so we now know that 100% of your ball flight is determined by how your club head moves through the impact position. How do YOU get into the correct impact position every single time you strike the ball? Well this is precisely the question I’ve been working on for most of my career. And after developing and refining it with hundreds of students, I’ve finally put it all together into a system. Anyway, there is a good reason I’m telling you all of this. Until recently you could only learn my Perfect Impact System in private lessons… and with my tight schedule I know this isn’t a realistic option for a lot of golfers. That’s why I was so excited to put the system on film and try selling it online. I love teaching the game and I love helping new students… but between my responsibilities here at Big Horn, my private lessons, and my personal life… there are only so many hours in the day! And so there is simply no way I can leave this offer up indefinitely. That means, if you want to join, you have to act fast! I can’t guarantee how much longer The Perfect Impact System will be available to new members. But the good news is, if you are reading this now, there is still time! This is an unbelievably exciting package… designed so that you don’t risk a dime trying it out at home. Sign up today and you will get instant, lifetime access to our membership website where you can watch all of the videos in The Perfect Impact System. (Yes, you will continue to have access even if we completely stop accepting new students). 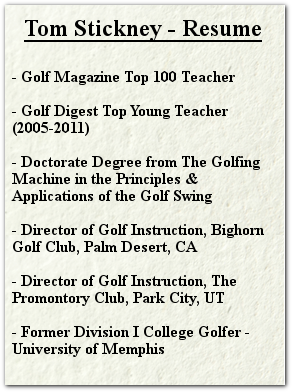 The system includes everything I teach in my private lessons… all packed into 87 minutes of high def video filmed on location at Big Horn Golf Club in Palm Desert, CA. Each video is right around 30 minutes long… the optimal length recommended by teaching specialists for a concentrated learning task. You will learn my complete system… with the added benefit of being able to rewind and rewatch until it becomes 2nd nature. The program includes everything I have learned about the Impact Position in 20 years on the lesson tee… nothing held back. It will teach you everything you need to know to get into the Perfect Impact position, starting with your set up and stance and then moving onto the dynamic motions of your Swing Path and Low Point. With easy to follow step-by-step instructions I break down exactly how to master the 4 Impact Factors, including my very best drills for ingraining the proper motions into your game. PLUS: Your order comes with 3 Bonus videos designed to fast-track your improvement. These videos are right alongside the Perfect Impact System in our membership site. But it’s not just about bragging rights… Golf gets a lot easier when you pick up 10, 20, or 30 yards off the tee. It can mean the difference between hitting a 4 iron and a 7 iron approach to the green. Now you’ll uncover a lot of power as you implement the Perfect Impact System into your swing, but we want you to be able to go out there tomorrow and start hitting the ball further right away. And that’s exactly what I designed the 7 Days to Longer Drives Mini Series to do. The series consists of the 7 easiest and fastest ways I know to add distance to a golf swing, period. Designed to be watched in bite-sized chunks over 7 days, you won’t believe how simple it can be to unlock 10, 20, or even 30+ yards without making major swing changes! The second bonus video is called Fix Your Faults, and that’s exactly what it is designed to do… Take you from wherever you’re at now and fix your major flaws… Straighten out the worst slices and hooks and get you hitting the ball more solidly. We will go through all of the common mishits… slices, hooks, duck hooks, tops, and chunked shots. In plain English that anyone can understand, you will learn what causes each mishit and how to correct it. You’ll get practical drills that you can take to the range that day to help erase even the most severe swing flaws. At the end of the day golf is supposed to be fun and our goal is to get you spending less time on the practice tee and more time out on the course enjoying your new game! And so that is what this 3rd bonus video is all about. Practice That Actually Lowers Your Score is designed to not only ingrain the Perfect Impact System as quickly and easily as possible, but to totally change how you look at practice. Say goodbye to hitting endless buckets of balls only to leave the range unsure if your swing is any better. In this video, you’ll learn how to practice the things that will directly lead to lower scores on the course… How to implement swing changes and pound them into your muscle memory as fast as possible… And how to naturally develop feel and control… at the driving range, on the practice green, on the pitching green, and on the course. It’s all online on our membership site and you can have instant access to it today! Can a simple program like this really ignite your game with enough raw power to shock your playing partners? Can it really obliterate your slice and guide your ball to the fairway as if it was pulled by a magnet? Can it transform your ball striking to the point where it practically forces you to shoot lower and lower scores? Important Testimonial Disclaimer: The following testimonials are from emails we have received, comments left on our site, surveys and other conversations with actual customers. However these results should not be viewed as “typical.” Your results will depend on numerous factors including the quality and amount of your practice, your current ability level, as well as other factors. Just wish to add that I joined your website a month ago and I’ve been practicing after watching your videos many times. I’ve never had such great results so quickly – improved ball flight and distance. I’ve had lessons in the past with many teachers, mostly with negative results. Our season is at a close up here in Toronto Canada. This gives me the whole winter to improve my swing, based on your lessons. Thanks so much for simplifying what others make so complicated. Just wanted to send out a big thank you for helping my golf game. I watched the beginning videos a couple of months ago after joining, where I mainly focused on the plane and grip position. I played 18 a few weeks later and shot an 87. I could have easily shot 80 if my wedges and putter were working as well as my driver and long irons were that day. Anyway, I have always knew my game was close to being a low 80’s player, but did not know how to figure it out until I saw the videos by Tom. Thank you for saving my game. The lessons are clear, easy to follow, and informative. I had developed a frustrating shank so I took your advice and watched the video on the set up. I made some small adjustments to my ball position and alignment, and presto! No more shanks! Tom, I’m in my late 60s now and have been forced to cut back on my golf due to back pain and stiffness. Well what I found is with the swing you teach, I am able to generate more power while still feeling like I’m swinging easier. It’s been much easier on my back and has allowed me to play an extra 18 each week without paying the price the next day. I play golf twice a month with the same guys… we all shoot in the high 80′s most of the time. We always play for something, just to keep it fun and competitive. I saw your program advertised and the impact factors you talked about made a lot of sense. I purchased and started watching 20 minutes of video every night and working on the changes about once or twice a week at the range. I FELT like I was hitting the ball much crisper but hadn’t played so I wasn’t sure. Well anyways, I played yesterday with the “gang” and I dropped an 81! I could have been even lower but I was really nervous since I’ve never shot in the 70′s. I have NEVER hit the ball that well, especially off the tee. That was only one round but it was my best ever and it seems the “impact factors” changed by swing for the better. I’ll keep you posted on the next round and hopefully can repeat that 81 and maybe even lower. I have never had that much fun playing golf. Thank you! If you’re ever in Scottsdale, love to buy you a round at the Royal Troon North. After watching your videos I am able to hit the fairways more often. It has give me a new confidence on the tee. I really love the practice bonus. After watching I spent a couple hours on the green down at my club, trying the methods you talked about. Well I have to say it started paying dividends almost immediately. I’m starting to really understand how to play different lies and shots around the green. It’s like I’m developing an instinct for how to get up and down. Coach Tom delivered a wonderful presentation that ANY level of golfer can find improvement. I know that he helped me understand that ball position is critical and also having level shoulders will make it a breeze splashing shots from the sand. I look forward to more online series. I have been a weekend golfer for 8 years. I mostly shoot in the mid 90s with an occasional round in the high 80s. For the last couple years I felt like I had hit a plateau… no matter what I did I just couldn’t get my scores down any lower. And I tried everything. I got a membership at my local range, I tried a bunch of training aids, and I took some private lessons. Then I purchased the perfect impact system. I don’t know what it was but it just *clicked* for me. For the first time I had a crystal clear idea of what to focus on and where I needed to go with my swing. Well after a few weeks of practice I have officially blasted through my plateau! Last week I had my best round ever (by 6 strokes!) and broke 80 for the first time. Tom, thanks for the lessons! Can’t wait to see how low I can go! Thank you very much for your time and effort!!!!!!!!!!!!!!!!!!! Just wanted to say, great help, really sound and practical advice!! I only started playing 5 months ago at the ripe age of 54!! People have told me I am too old, but with you guys I’ll get there!!! Awesome instruction! Easy to understand. Helping to reduce strokes already. They represent beginners, low single digit handicappers, the young and the old… the only difference between them and you is they put their doubts aside and gave The Perfect Impact System a try. But until we pull the plug, you can get access to the same program for just a fraction of the price. Here’s the deal: The Perfect Impact System is an online instructional program. No waiting for DVDs to arrive in the mail – sign up today and you will get instant access to over 2.5 hours of video instruction covering all aspects of the full swing. The price is just $67. That is just a tiny fraction of what others have paid for the exact same information. A single lesson with me costs up to $250! $67 is less than one green fee at most golf courses. It is less than a single lesson. And it is less than that fancy new driver. Your order comes with a 2 month no-risk, no questions asked, 100% money-back guarantee! 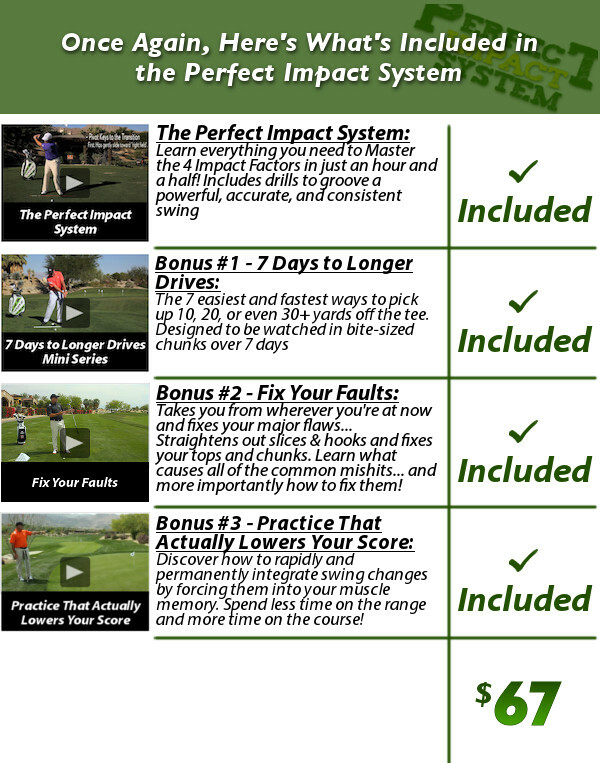 Order The Perfect Impact System and start watching right away on our membership site. 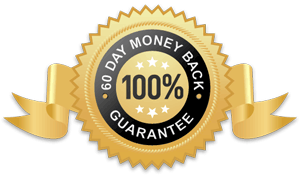 If, for any reason or for no reason at all, you aren’t completely satisfied just let us know and I’ll personally guarantee you a complete and prompt refund… And you can do this for up to a FULL 2 MONTHS AFTER YOUR ORDER! No hassles or forms to fill out. Nothing to send back in the mail. No problems at all. How can I afford to offer this? I’ve seen thousands of students transform their games using the techniques I teach in the Perfect Impact System. And I’m pretty darned confident it will work wonders for your game as well. Listen, I understand it might be your first time buying golf instruction on the internet. And you might be wondering can I really learn online? Or could this really be as good as it sounds? Which is why I took all of the risk out of it by including the money-back guarantee. So all that is left is to just imagine it: standing on the tee watching your drive sail a full 50 yards past the rest of your foursome. Seeing your playing partners look on in envy as you decimate your previous best rounds. You have nothing to lose so take advantage of this exciting offer today. Because I don’t know how much longer it will be open to new students. PS: Please sign up for The Perfect Impact System right now, while you are still reading. There is no risk, and yet this incredible package may never be offered again! So don’t let this chance to change your game forever slip through your fingers.